Alpha Sigma Alpha became a full member of the National Panhellenic Conference in 1951. The National Panhellenic Conference provides support and guidance for its 26 member inter/national sororities/women’s fraternities and serves as the national voice on contemporary issues of sorority life. Founded in 1902, NPC is one of the oldest and largest women’s membership organizations representing more than 4 million women at 655 college/university campuses and 4,500 local alumnae chapters in the United States and Canada. Offer a good, democratic social experience. Create, through their ideals, an ever-widening circle of service beyond membership. Develop an individual’s potential through leadership opportunities and group effort. Sorority is a social experience based on the fundamental right of a free people to form voluntary associations. It enriches university/college life. The young woman who wants a sorority experience will find it possible to belong on most campuses today. Sorority membership is a social experience arrived at by mutual choice, selection and ultimately invitation. Young women feel a continuing need to belong. Parents appreciate sorority values and standards and cooperate to make membership possible. 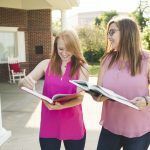 College administrations, recognizing the values of sororities, continue to welcome them on their campuses and to invite them to establish new chapters.